Jamaica is perhaps more known for its world beating athletes such as Usain Bolt and Sheri Ann Fraser and Reggae music Maestros such as Bob Marley, Peter Tosh, Joseph Hill and Burning Spear. However, did you know that it is also a country that has abundance of natural wonders that keep tourists engaged throughout their stay in Jamaica? Perhaps to put this in context, you need to know where the word Jamaica came from. The native dwellers of Jamaica, the Taino, called this Caribbean Sea Island the xaymaca, which is translated as the ‘land of Water and Wood’, or, ‘Land of Springs’. Below are a few of its most remarkable natural wonders. Jamaica is perhaps more known for its world renown athletes such as Usain Bolt and Sheri Ann Fraser, as well has Reggae music Maestros such as Bob Marley, Peter Tosh, Joseph Hill and Burning Spear. However, did you know that it is also a country that has abundance of natural wonders that keep tourists engaged throughout their stay? Perhaps to put this in context, you need to know where the word Jamaica came from. The native dwellers of Jamaica, the Taino, called this Caribbean Sea Island the xaymaca, which is translated as the ‘land of Water and Wood’, or, ‘Land of Springs’. Below are a few of its most remarkable natural wonders. True to its name, Jamaica has a series of water falls. 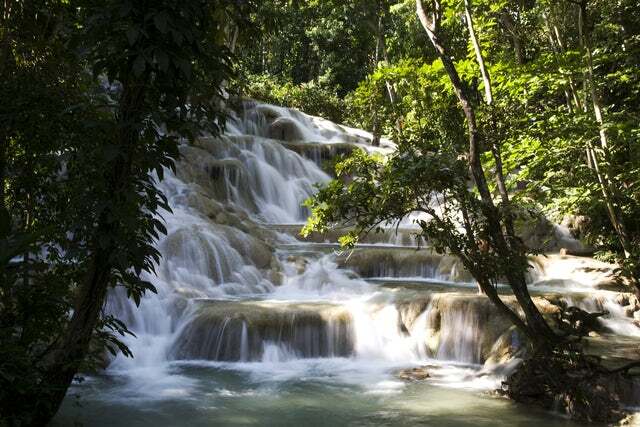 One of the most visited water fall is the Dunns River Falls. It is just a few minutes’ drive from the Ocho Rio's Cruise Ship Dock. It boasts a multi-tiered, cascading limestone slope that is not too difficult to climb. It is suitable for 'water hiking'. These are located in Discovery Bay on the Northern Coast of Jamaica. They derive their name from the green algae that dots its inner walls. Amazingly, its innermost cavern has a crystal clear underground lake. Whenever you are in Jamaica, this is a must visit destination. This is another of Jamaica’s natural wonders. It is located off the A4, just a few minutes due west from Port Antonio. It is a picture perfect place to enjoy nature. Other major natural wonders in Jamaica include; Blue Mountain Peak, Mahoe Falls, Tacky Falls and Mayfield Falls. Like all Caribbean islands, Jamaica is a very beautiful country. Being the 5th largest Island in the Caribbean with a land mass of 10,990 square kilometers; a tourist will have a wide choice on the places to visit. International tourists can use the Montego Bay Airport or use a cruise ships that dock at Port Antonio and Ocho Rios. Getting around is quite easy. There are various car rental companies, taxi operators and a number of tourist bus companies. All you need to do is make a reservation for your mode of transport.